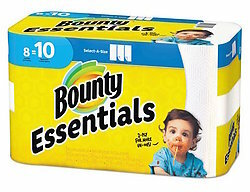 Bounty Essentials Select a Size Paper Towels (8 Pack). Clean up has never been so easy. Each pack contains 8 rolls of paper towels with 84 sheets per roll. The unique ability to select a size, makes it easy no matter how big or small your mess is.